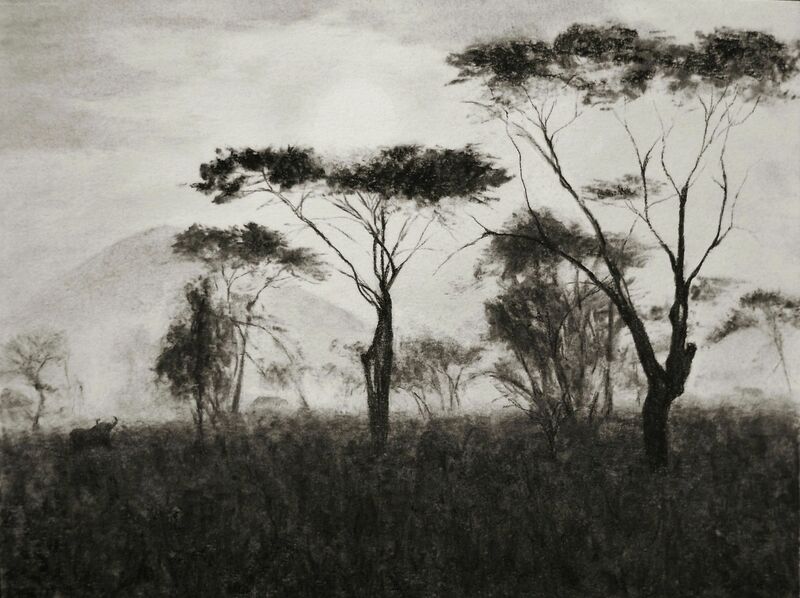 Serengeti Sunset, a charcoal drawing (9×12) was done on Strathmore Bristol Vellum paper using compressed, willow vine, pencils and loose charcoal powder. Most of the textures in the piece was a process of putting the charcoal on and taking it off with a variety of tools (tortilium, pad, Q-Tips and kneaded erasers). If you notice the sun, it wasn’t quite brilliant enough to distinguish it from the clouds and rest of the sky, so a bit of charcoal was used around the sun letting it be barely there combining brilliance and haze. A few visitors that made their way into the drawing, can you see them? Thanks for checking in ~ click onto the image for a larger view. This entry was posted in Drawings and tagged africa, animals, art, charchoal, drawing, fine art, grass, sunset, trees. Bookmark the permalink. An awesome rendition Mary. Love it!! Thanks so much Emily for checking out the drawing. It was a great scene for the subtleties of elements of the region – charcoal was the perfect medium to bring it all out. Hope you are well – loved the photographs from your trip. Thank you Maurice – very nice to meet you. Such texture you get with your charcoal. Those wispy mountains look so real. And the visitors are just hinted at, just like a real safari would not get too close. Well done! Love your description and thoughts on the drawing Brenda. It is one of those scenes/places where we are so much better off to just let that world be to themselves. Perhaps that the ‘magic’ as Jet said of Serengeti. Thanks again my friend. Fantastic drawing Mary! The magic of the Serengeti, the sun, the acacia trees, and the animal looking up–very well expressed. Hi Jet, thanks so much I really appreciate your thoughts on the scene – it was a great piece to work out in charcoal. There is a certain magic in this region, no doubt that you are familiar with. Thank you Rita for your kind words and description of the trees. I really enjoy using charcoal for landscapes, especially trees. Thank you very much Sabine for your lovely feedback. This is gorgeous! I love that rich contrast of light and dark. And I really like those thin, confident branches – you’re very good at charcoal drawing. Excellent work! So great to hear from you Jenna! Thank you very much for your thoughts on the drawing, the elements that you mentioned are what attracted me to draw the scene. Thanks again, have a beautiful weekend. You’ve got it. The trees, the haze and a little elephant. Is that what I see? Thanks so much Joanna for your comment! Ah those visitors can be whatever you’d like them to be ~ it was a great scene to create in charcoal. It seems impossible to capture a sunset in this art medium but you have done it and done it well! Thank you so much Dorann, your words are magic to my ears! Glad you enjoyed the drawing ~ have a wonderful weekend. Wonderful. Are the trees Acacia tortilis or Acacia abyssinica? Thank you my friend – I think that these are the Acacia Tortilis species. But to tell you the truth it’s very difficult to tell the two differences apart in all the images I found. Absolutely stunning. Your art is so versatile. The common ground to each piece is the ability to transport us to another place. Your. Art. Reaches. Me. Every. Time. Mary, you have truly caught the moment here, the quietude of the coming dusk. Pure magic. Thank you Paul, your description was what I was looking to capture. Thank you for seeing the vision. Thanks Jo – glad you enjoyed the scene! The branches of your trees as so very sensitively rendered. Little portraits of the individual angles. Fabulous. Awesome description Elena – loved the “little portraits of the individual angles.” Really appreciate your feedback and colorful words describing the scene. Thank you Uncle John and for connecting your favorite place to this drawing – the atmosphere is unlike any other place. I was hoping to convey the subtle light, appreciate your thoughtful comment. What is so striking of the image is that I can feel the temperature of the scene, and without color..I am flabbergasted , and love it! Believe me that I understand as an artist/musician for that kind of connection. It helps one to keep going, keep striving. It can feel like fresh air. You are so right, that’s what it’s all about – a sort of endorphin rush. Awesome Linda – I’m so glad you blew up the drawing. You are so right there are three bovines wandering around out there!! I really enjoyed your thoughts on this piece, thanks so much! As I first saw this without even paying attention to the title, Africa popped in my mind, the tree shapes are typical for that region and immediately recognizable, then I read the title and I thought of course that makes perfect sense! What a beautiful multi layered piece Mary. The Serengeti is a complex region and you perfectly worked in so many elements of that: sunset, mountain, high bushes, animals all that with the haze, you really brought in the atmosphere for which Africa is known for. I especially love the trees, the shape, form and structure of it is so “African”, you executed them perfectly! There are many elements to this and you perfectly managed to bring this mysterious and atmospheric land onto your drawing and all that in charcoal! Excellent and most beautiful! Hi Eva, loved reading your thoughts on the region and how the elements of that special place connected to this drawing. It was a very different scene for me, but the quietness of the atmosphere and strength of the tall and graceful trees is what attracted me to draw it. It’s amazing to me how you sense what I’m trying to convey in each and every piece – in this case you are very perceptive with the direction of my work here. Thank you my friend! That is why you’re a very special artist, you can make us feel connected to your artworks, make us feel it, be in it and sense your emotions which you went trough while working on it. You pour your heart and soul onto! Mary I love this. I feel like I am there. Thank you so much Nicodemas, a great compliment. exquisite use of the charcoal and media! beautiful inflections of tone and you have a wonderful, sensitivity that makes the media perform like ‘magic’………… I love the trees and the foliage, This is a Lovely art work Mary!! Hi Debi, thank you so much for your thoughtful and generous feedback on the scene – I really appreciate it. There is so much to explore with charcoal and its limits, all good fun. Thanks again! Oh yes, I see the visitors, Mary! The detail is amazing…well done! Thanks Jill, awesome that you saw them too! Only you can get this kind of detail with charcoal! Love the visitors too! Thanks for sharing, Mary! Thank you Laura for your nice compliment and way to go on spotting the visitors! I’m really enjoying reading your thoughts as you walk through the grasses and examine each of the elements – so exciting, you saw each as presented. Thanks so much Marina, this was very special. Wonderful charcoal drawing. I can point out the visitors there….the long grass and the mighty trees…a perfect Serengeti sunset! Very cool Maniparna, glad you saw the visitors – thank you! So glad you enjoyed the drawing! This is really, really beautiful, Mary. It must be wonderful to be able to draw like this! I have never been to Serengeti – but this looks just like on TV! Thank you so much Ann-Christine – I enjoyed your reaction to the drawing. I’ve never been to Africa and this region looks like a gorgeous area to visit. Appreciate your thoughtful and enthusiastic response. The detail you give with charcoal is astonishing, Mary. My envy continues unabated! This charcoal drawing is like a beautiful brush painting. So well composed, and the lighting is just perfect. Thank you for sharing with us, Mary! Awesome description Amy, loved reading it. Thanks very much. Thank you my friend, appreciate your thoughts – charcoal is a lot of fun and unbelievably messy. Thank you so much Janet for your continued support and encouragement. It was my goal to work the atmosphere, a little easier in graphite for me than charcoal perhaps a smooth paper would have given me a little less texture in the sky. I really love working with charcoal, very exciting medium. 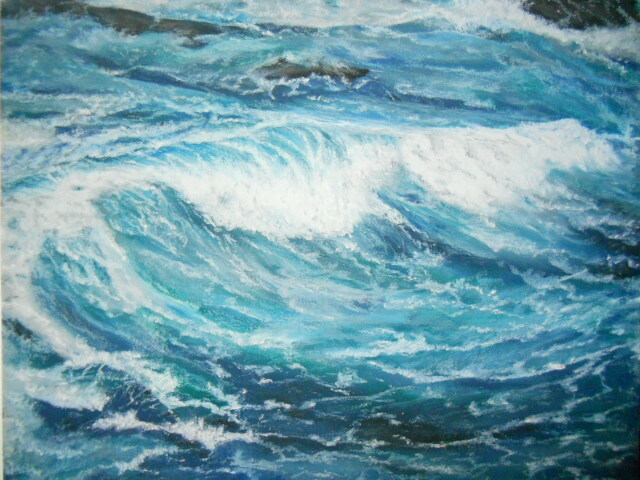 Thank you Dsaquarelles – that is what attracted me, were the brilliant contrasts. This one was a lot of fun to develop. Hi Rebecca, thank you for your kind words on this scene! Beautiful work Mary. I do see the animal sneaking in! Thank you so much Rhonda – yeah, glad you noticed!! Thanks Outside – they were a lot of fun to draw. Very nice, as always, Mary, and yes, I did spot the visitors! I’ve never been to Africa; those trees are not familiar to me, what are they called? Hi Cynthia, thanks so much. Great question, these trees (I believe) are called Umbrella Thorn Acacia. From what I understand the inside branches are soft and green, while the outer branches are thorny which prevents Giraffes from eating them. They are so graceful looking – beautiful shapes that can be seen both near and from a distance. So wonderful – thank you for sharing your sunrise, it’s fantastic. The reference image was from Ian Quigley (pmp) who took some amazing shots while in Africa – this one held so much appeal that I had to see if I could work the charcoal to give the impression of a sunset. Thanks so much for your comment! Thank you – charcoal is a fascinating medium that lends itself to those wonderful sweeps, especially with portraits. I really enjoyed your comment!! This is lovely – and I see a couple of visitors. Thank you Fiona – awesome!! !